election-day, originally uploaded by alister. 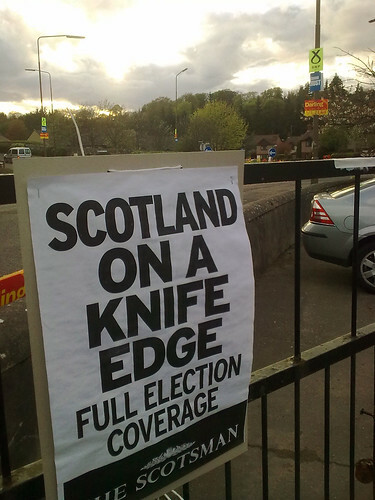 Scotland on a knife edge? Wouldn't have thought so, more likely a safe labour majority in Scotland tonight and probably a dissappointment for the SNP who will be squeezed in the bid to keep the tories out. The real left will be even more squeezed thanks to our first past the post system. I expect a small tory majority, but will be rather pleased if that does not come about and the Eton mess slink back to their dens with their tails between their legs.